PACKAGED: Kit with specific instructions. LOCATION: Cyanokits are available in caches located in each county in Homeland Security Region 3. Known or strongly suspected cyanide intoxication, or smoke inhalation with suspected cyanide component. 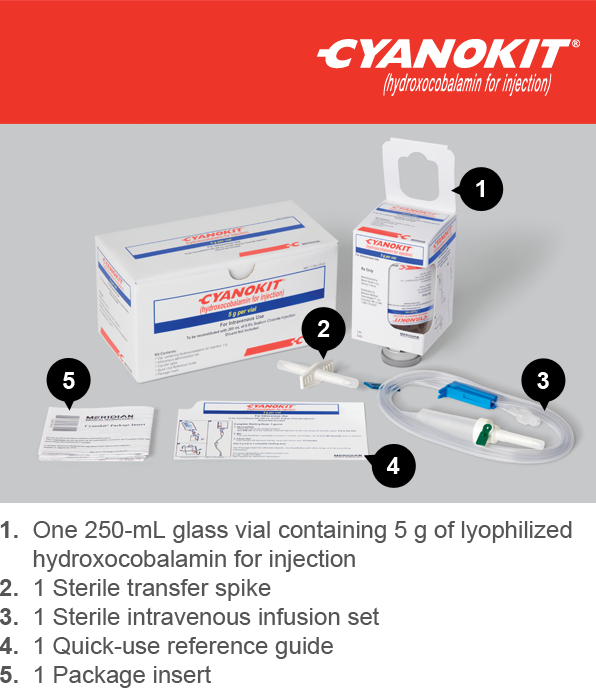 For non-arrested patients, cyanide antidotes are indicated if there is a known or strongly suspected cyanide exposure. The patient may have been exposed to smoke from structure fires and presents with altered mental status, seizures, shock, or difficulty breathing. Reconstitute: Place the vial in an upright position. Add 200 mL of 0.9% Sodium Chloride Injection to the vial using the transfer spike. Fill to the line. One 5-g vial is a complete starting dose. ¨ Pediatric dose is 70 mg/kg IV over 15 minutes; max dose of 5000 mg; may repeat a dose of 35 mg/kg; max dose 2500 mg, depending on severity of poisoning and clinical response. Do not administer other cyanide antidotes to the same patient. ADULT: Yes—must also be authorized by department Medical Director.